New set of Tail Gate Latches for a John Deere 4X2 & 6X4 Gator. This is for a set, you will receive one right hand and one left hand latch. The new tailgate latches fit our gator and work great. These work as they should, being Original JD. I ordered a set of tailgate replacement latches for my John Deere Gator from your company. They shipped right away. Installation was easy, & latches fit perfectly. 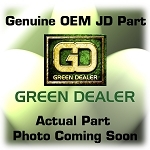 I have purchased merchandise from Green Dealer in the past..and I am once again so please with the timeliness and quality of items I purchased. The latches fit as recommended by telephone personals advise.